Heh, I'm quoting you. And yup, the build is stable. Thanks, Stingy! For Some reason my computer won't let me play it at all. ¯\_(ツ)_/¯ The game is Windows only, so that might be it. I have Windows 10 Pro and it works for me. 10/10 - can definitely vouch! Game is stable, and just difficult enough to keep interesting. Music is 100% on par, making for countless hours of fun, with looped midi's for eternity. 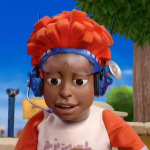 A VR game where you could feel like you're in Lazytown and meet all the characters would be great. hello i have a question... can i upload a video of this game? HP would still stand for Health Points, while MP would be EP, for Energy Points--if you have enough you can use a Super Move! Robbie would probably have LP, or Lazy Points XD The Mayor and Bessie could do item shops and sidequests, while the main party would be Sportacus (balanced), Stephanie (the speedy one), Ziggy (the tank), Pixel (the guy who uses gadgets), Trixie (physical attacker), and Stingy (the bard?). The plot would probably be something like 'Robbie messed with one of Pixel's inventions and now the entire world is a game! In order to free the town everyone has to team up and get to Robbie's lair in order to turn off the machine.' Different scenarios could be stuff covered in episodes, like Stephanie and Rottenella having a dance duel, while others could be original, and there'd have to be a 'Sportacus is rendered comatose by a sugar apple' plot at least once XD Maybe one of Robbie's bases is on the Moon! I think a LazyTown RPG would be cool. Wow, this game IS fun! At first I got a game over when I bumped my head on the windowsills when trying to jump over a pit, but I got to see the Genie! The visuals are cute too, and I love the 8-bit music! It's a little hard to tell what's a wall and what isn't, though, and I think some of the instant-death areas are hard to see from the point you have to jump across them. I also hit Escape by accident and closed the game instantly. Are there any save points? EDIT: I finally beat the SoccerBot!